Lewis Out as Chairman at BofA - Bank of America said after the market close Wednesday that shareholders voted for a proposal to make the role of chairman at the bank independent. CEO Kenneth Lewis gave up his chairman role and director Walter Massey was elected the new chairman, Bank of America said in a statement. All 18 directors were re-elected, although 32.67% of shareholders voted against Lewis and 37.4% voted against director O. Temple Sloan, Bank of America reported. The Fed Leaves Rates, Changes Statement - The Federal Reserve left interest rates unchanged Wednesday after concluding its two day meeting. The central bankers said that the economic outlook had improved over the last six weeks, but the economy was likely to remain weak for a time. The FOMC said that spending has stabilized and that the pace of the downturn appears to be somewhat slower. Fed officials made no changes to their plans to buy Treasurys and other securities to support the flow of credit to the economy. The vote was unanimous. Obama Was "Hopeful" for Chrysler, But Talks Fall Apart - President Barack Obama said Wednesday night in a prime-time news conference that he's "very hopeful" that the U.S. and Chrysler can reach a solution to keep the venerable American automaker as a viable company. Obama also said he'd love to "get the U.S. government out of the auto industry as quickly as possible." Unfortunately, the talks fell apart, and according to The Wall Street Journal the car maker will file for Chapter 11 protection Thursday. Administration officials, who have been braced for a Chrysler bankruptcy filing for weeks, say all the pieces are in place to get the country's third-largest employer through the court quickly, perhaps in a matter of weeks, the report said. Senate Passes FY 2010 Budget Plan - The Senate approved a $3.55 trillion budget blueprint for fiscal 2010 on Wednesday, joining the House in handing President Barack Obama a legislative victory. The vote was 53 to 43 (yep, new Democratic Senator Arlen Specter voted against it). The budget preserves Obama's priorities and paves the way for health-care reform later this year. As an Associated Press article states, "Under the plan, the deficit would drop to $523 billion in 2014, but even that figure depends on several unrealistic assumptions, notably that Congress will devote only $50 billion a year for operations in Iraq and Afghanistan for 2011 and beyond, and unrealistic projections of costs for core Pentagon operations. There's considerable accounting legerdemain in the plan as well, reflecting a struggle by Democrats to cut the budget deficit to 3 percent of the size of the economy within five years — a figure economists say is sustainable without adding crippling debt to the nation's books." 100 Days: 'Harry, I Have a Gift' - By Daniel Henninger - The Wall Street Journal - "Senate Majority Leader Harry Reid, in a book out next week, tells of congratulating freshman Sen. Obama on a phenomenal speech. Without a hint of conceit, Mr. Obama replied, 'Harry, I have a gift.'" One Hundred - The New York Times - "Crises, not days, is the first word that comes to mind when we think about the number 100 and Barack Obama’s presidency." GDP Down More Than Estimated, But With a Bright Spot - The U.S. economy contracted again in the first quarter of the year as business investment declined at a record rate, the Commerce Department reported Wednesday. Real gross domestic product fell at a 6.1% annualized rate in the first quarter, nearly matching the 6.3% decline in the fourth quarter of 2008. The interesting issue was the news from the business sector. Companies halted new investments, and shed workers and inventories to bring down production and stockpiles to match the lower demand from U.S. and foreign markets. Consumers did better than expected, so this was a bright spot to the report. Consumer Spending Up - Retail stocks opened higher Wednesday as the Commerce Department data showed a rebound in consumer spending while the U.S. economy contracted again in the first quarter. The S&P Retail Index rose 0.6%. Citi Asks For Approval of Special Bonuses - Citigroup is seeking U.S. Treasury approval to pay special bonuses to several key employees at the bank, The Wall Street Journal reported Wednesday, citing people familiar with the matter. The report said Citi wants to pay the stock-based bonuses to staff at its Phibro trading unit to keep them from defecting. Phibro has produced steady profits for the firm throughout the credit and market crises of the last 2 years, and, according to the Journal, Citi paid its chief Andrew Hall close to $100 million last year. The report said Citi CEO Vikram Pandit raised the issue in a meeting earlier this month with Treasury Secretary Timothy Geithner. The report said Geithner has not made a decision on the matter. Oil Inventories Rise, Gasoline Inventories Fall - U.S. crude-oil inventories rose more than expected last week, but gasoline stockpiles had a surprising decline, the EIA reported Wednesday. Crude inventories increased by 4.1 million barrels in the week ended April 24, while gasoline inventories decreased by 4.7 million. Analysts surveyed by Platts had expected an increase of 1.8 million barrels in crude and a rise of 900,000 barrels in gasoline supplies. The news sent oil prices higher by about $1. Consumer Confidence Jumps in April - The U.S. consumer confidence index jumped to 39.2 in April from 26.9 in March, the Conference Board reported Tuesday. The 12.3 point gain in the index was the fourth-largest ever in the 32-year history of the survey. Economists were expecting the index to rise about five points to 30.5. Consumers were a little happier about the present situation than they were in March, but the big improvement came in the expectations index, which surged to 49.5 in April from 30.2 in March, the biggest increase since the fall of Baghdad in the spring of 2003. Home Price Decline Slowing - Home prices fell 2.2% in 20 major cities in February after a 2.8% decline in January, according to the Case-Shiller home price index released Tuesday by Standard & Poor's. Prices in 20 cities are down 18.6% in the past year, compared with a 19% drop in the 12 months ending in January. It was the first time in 16 months that the decline in prices did not set an annual record. Prices fell in all 20 major cities in February, led by a 5% drop in Cleveland. Valero Income Up 18% on Gasoline - Valero Energy said first-quarter net income rose 18% to $309 million, or 59 cents a share from $261 million, or 48 per share. The year-ago period included a pre-tax benefit of $101 million, or 12 cents a share for an insurance recovery. Operating income rose 7% to $507 million on "higher refining margins on gasoline and secondary products such as fuel oil, asphalt, and petroleum coke," the company said. Valero reported lower refining operating expenses due primarily to lower energy costs. Revenue fell to $13.8 billion from $27.9 billion, while total costs and expenses dropped to $13.3 billion from $27.5 billion. Analysts expected Valero to earn 53 cents a share, according to a survey by FactSet Research. Treasurys Up, Oil and Metals Fall on Swine Flu - US Treasurys were up in morning trading as a safe haven for the growing concern of the Swine Flu. Oil fell close to 2% again today over fears that the illness will curtail international travel and oil demand. Meanwhile gold and copper were also down on the news. Gold was being sold to raise cash according to many analysts, while copper was down on fears that the ramped up international stimulus plans would be slowed by an outbreak. Airlines Fall on Swine Flu - Just as oil fell, airlines also dropped on the Swine Flu news. The most profitable flights for airlines are international flights, so a decrease in international travel could potentially hurt the bottom line. The restrictions into and out of the various countries will play a part. GM Wants to Swap Common Stock for Debt - GM said Monday it intends to offer $27 billion in common stock to its debt holders as part of a restructuring plan. According to the SEC filing, GM will offer 225 shares of common stock to each $1,000 of debt. The Detroit automaker values the offer at $27.2 billion, and has set a deadline for debt holders to respond by May 26. "Exchange offers are a vital component of GM's overall restructuring plan to achieve and sustain long-term viability and the successful consummation of the exchange offers will allow GM to restructure out of bankruptcy court," the company said in a statement. GM May Close Pontiac Unit - GM sources have told The Wall Street Journal that they may close the Pontiac unit of GM after 82 years. The sources cited slumping sales and bottom line issues as the culprits. GM Gets $2 Billion from Treasury - GM has received $2 billion in fresh working capital from the Treasury Department, officials said Friday. The government said last month that it would provide GM and Chrysler with working capital while rescue talks proceed. Oil Falls 5% on Swine Flu Outbreak - Oil fell 5% ($2.50) on fears that the Swine Flu could have global implications on the economic recovery. As with previous outbreaks (SARS, Avian Flu), these are usually just knee jerk reactions and not based on actual evidence. Thain Says He Was Not Alone in the Bonus Decision - John Thain, former CEO at Merrill Lynch, said Bank of America didn't tell the truth about its role in bonuses paid to Merrill employees as well as losses at the brokerage giant, The Wall Street Journal reported Monday. Thain, who said Bank of America CEO Ken Lewis asked him to resign, told the newspaper that he and Lewis agreed in writing the bonuses could be handed out before B. of A. 's acquisition of Merrill closed, which resulted in the early payments that have sparked a firestorm. "The suggestion Bank of America was not heavily involved in this process, and that I alone made these decisions, is simply not true," Thain told the Journal. **Note - I wonder if Thain has paid back the $1.22 million renovation for his unsuitable office when he became the CEO at Merrill Lynch. The article below is just about a must read for anyone following the market. There have been questions as to why various banks now want to return TARP funds, and the story of Ken Lewis and Bank of America is a good place to start. Busting Bank of America - The Wall Street Journal - "Treasury Secretary Paulson, who says he was acting at the direction of Federal Reserve Chairman Bernanke, told Mr. Lewis that the feds would fire him and his board if they didn't complete the (Merrill Lynch) deal. Mr. Paulson told Mr. Lewis that the government would provide cash from the Troubled Asset Relief Program (TARP) to help BofA swallow Merrill. But since the government didn't want to reveal this new federal investment until after the merger closed, Messrs. Paulson and Bernanke rejected Mr. Lewis's request to get their commitment in writing." In due course, I will list some very good articles and editorials, but during the week, I noticed one article that hit home with me. I would imagine that most of the readers of this blog have absolutely excellent credit and no issues at all. Thankfully, I am the same, and so it struck me as rather odd that Bank of America would send me a notice saying my credit card interest rate was being increased. While this sort of thing could happen from time to time, the rate was being increased from Prime plus 1% (currently 5.25%) to Prime plus 3%. Not much of a difference till you read the fine print that shows the minimum rate would now be 11% (from it's current rate of 5.25%). This is a quite dramatic change indeed. Credit-card shocks - Marketwatch - "He asked why the bank jacked up his rate for what he believes was no apparent reason and was told it was necessary to offset losses from the growing numbers of low-performing or default accounts. 'It was just incredible to me that they would do that like that,' he said. 'I said it sounds like they're spreading the wealth and the rep said, 'Yep, that's what's happening.'" IMF Plans to Issue Bonds to Raise Funds for Lending Programs - Bloomberg - "China and Brazil are among a handful of countries that have expressed interest in purchasing IMF-backed bonds which would give member states a different way to contribute to the Washington-based fund. The IMF has never issued bonds." GM Employee Stock Fund Dumps All Company Shares - Yahoo/AP - "General Motors revealed in a regulatory filing late Friday that its employee stock-purchase plan has unloaded all shares of the company in favor of short-term and money market investments." We Need Public Directors on TARP Bank Boards - By Robert B. Reich - The Wall Street Journal - "I don't know whether Bank of America shareholders will oust Ken Lewis from his chairmanship next week. I don't know if Treasury Secretary Timothy Geithner will eventually do it, either. What really worries me is I don't know who would actually be responsible for doing the deed, or by what criteria." The Stress Test Results - The New York Times - "The nation’s largest banks received the results of their government stress tests on Friday. The rest of us should get the news next week. For the Obama administration, the tests could be a major success, if they provide clear data on which to base a bank-rescue strategy. Or the tests could be one of its worst failures, especially if they are not seen as credible." Moore’s Law and the Law of More - By Thomas L. Friedman - The New York Times - "It is not an exaggeration to say that the team that President Obama appointed to promote his green agenda is nothing short of outstanding — a great combination of scientists and policy makers committed to building an energy economy that is efficient, clean and secure." Political Wind Blowing Against Unions - Investor's Business Daily - "When Barack Obama won the election, Big Labor's ambitions soared. It spent $400 million to elect Democrats and expected an easy ride ahead. A hundred days into the Obama administration, it's playing defense." Card Check Is Dead - By Thomas Frank - The Wall Street Journal - "Now, to be pro-labor is to resign yourself to years of failures and defeats, with few tea parties along the way for consolation. Even so, the setback on EFCA has to be a bitter one. Union members worked hard to elect Barack Obama and the Democratic Congress, as they did to put Jimmy Carter and Bill Clinton in the White House. And now, just as in those previous two periods of Democratic governance, labor's friends are having trouble enacting basic labor-law reforms." 'Elections Have Consequences' - By Brian M. Carney - The Wall Street Journal - An interview with Judd Gregg - "I should have been smart enough to see the daylight before I walked in the door. . . . I don't think there's any big lesson here for anybody but myself, which is the obvious: It would have been impossible for me to be with the president 100% of the time, which is what a cabinet secretary has to be." Transparency and the Right to Know - By Mary Graham - The Boston Globe - "What do these recent incidents have in common: home purchases based on misleading mortgage costs; deaths associated with widespread contamination of the blood thinner heparin; and huge financial losses suffered by even sophisticated investors on exotic debt instruments?" World Bank Report Card - The Wall Street Journal - "The world's finance ministers are gathered in Washington this weekend for the spring meeting of the World Bank, which recently announced that it would spend up to $45 billion over three years for public-works projects alone. But as they shovel the money out the door, they might want to consider how carefully it will be spent -- or misspent." The Hollywoodization of Wall Street - By Neal Gabler - The Boston Globe - "The recent reports of Wall Street's own excesses - private planes, lavish parties, gold-plated bathroom fixtures, and customized limousines - all sound like pure Hollywood. And that might not be coincidental." I apologize for the issues yesterday. You never realize how much you use the internet, e-mail, etc. until you cannot use it. Anyway, the issues look to be handled now. On to the notes for the day. Fed Buys $7 Billion in Short Term Treasurys - The Federal Reserve Bank of New York bought $7 billion in Treasurys maturing in 2012 and 2013 on Thursday in an effort to continue to keep rates low. Dealers submitted $15.99 billion to be purchased. It's the second and last purchase planned for the week. The Fed said in March it plans to buy $300 billion in Treasurys in the coming six months. Treasury to Sell $101 Billion Next Week - The Treasury Department said Thursday it plans to sell $101 billion in debt next week, slightly more than many analysts expected. It will auction $40 billion in 2-year notes on Monday, the same amount as last month. That will be followed by a record $35 billion in 5-year notes and $26 billion of 7-year notes on Thursday. Natural Gas Inventories Rise - U.S. natural gas inventories rose 46 billion cubic feet last week, according to an EIA report. At 1,741 billion cubic feet, stocks were 459 billion cubic feet higher (35%) than last year at this time and 322 billion cubic feet above the five-year average. Natural gas lost 9.2 cents to $3.44. U.S. Existing Home Sales Fall in March - Resales of existing homes and condos fell 3% in March to a seasonally adjusted annual rate of 4.57 million, with distressed sales now accounting for half of all sales. Sales are down 7.1% in the past year, the National Association of Realtors said. First-time buyers accounted for 53% of buyers in March, the group said. First-time buyers can get federal and state tax credits versus existing homeowners (Note - if Congress would pass the Isakson bill with $15k for all would that boost sales?). Sales were weaker than the 4.63 million pace expected by economists. Ken Lewis Pressured to Stay Silent - Bank of America CEO Ken Lewis said he was pressured by Federal Reserve Chairman Ben Bernanke and former Treasury Secretary Henry Paulson not to talk about the problems surrounding the bank's deal to acquire Merrill Lynch, The Wall Street Journal reported Thursday. The newspaper, which obtained testimony Lewis gave before New York's attorney general in February, reported the bank CEO told prosecutors he thought Paulson and Bernanke were urging him to keep silent about the financial troubles gripping Merrill. Lewis' testimony was related to an investigation into bonuses paid to Merrill employees before the merger closed, the Journal said. Note - On one hand, Lewis is supposed to disclose problems, and on the other, the Fed Chairman and Treasury Sectreary are telling you if you say anything the financial markets will collapse. Talk about being put between a rock and a hard place. Financial Reforms We Can All Agree On - By Charles W. Calomiris - The Wall Street Journal - "By now we all know how the subprime mortgage market, government policies that encouraged riskier mortgage lending, and overleveraging led to the current financial crisis. But what do we do now to lower the odds of a similar financial meltdown in the future?" Stress Test Scores ‘C’ If Name Ends in ‘itigroup’ - By Mark Gilbert - Bloomberg - This is a bit of a funny little article. "Tomorrow, the U.S. authorities are scheduled to disclose the methodology for the stress tests that will gauge the creditworthiness of the 19 largest U.S. banks. Below are a few examples of the kinds of searching, penetrating questions the Treasury Department should ask. Some sections have point scores. Others will be judged more subjectively." connectivity issues at the office, so I cannot even post. We have reported the problem, so it is being repaired. impossible to send a post of any length. Secretary Geithner Says He Has The Resources Necessary - Treasury Secretary Geithner on Tuesday said there is $109.6 billion in bank bailout funds remaining of a $700 billion bank bailout package. Speaking before the bailout package's congressional oversight panel, Geithner said he expects over the next year that $25 billion will be re-paid to the Treasury from banks seeking to return capital from the program, which would bring the total amount left to $134.6. Already six smaller banks have returned capital they received from the program and both Goldman Sachs and J.P. Morgan & Chase have said recently that they are seeking to return $10 billion and $25 billion respectively. In a table provided to the panel, Treasury says the $25 billion it expects to be re-paid is a conservative estimate. Delta - Revenue Looks to Have Bottomed Out - Delta Air Lines CEO Richard Anderson said Tuesday that the deterioration in revenue appears to have bottomed out in the first quarter. "We've seen some signs of stabilization as the revenue environment appears to have bottomed out," Anderson said in a conference call. "But it's still a bit early to call, and we expect to face significant head winds throughout 2009." Anderson said Delta would have broken even in the recent quarter excluding the losses from the company's fuel-hedging contracts. Those contracts, priced above the market now that benchmark oil prices have plunged since July, will be largely completed by the end of the second quarter, the company said. Bank of Canada Cuts Rates - The Canadian dollar fell on Tuesday after the Bank of Canada lowered its overnight target rate by 25 basis points to 0.25% and said that the Canadian recession will be deeper than anticipated. The rate cut was in line with market expectations. Canada's central bank also said that it considers 0.25% to be "the effective lower bound for that rate." Fed Buys $7 Billion in Treasurys - The Federal Reserve Bank of New York bought $7 billion in Treasurys on Tuesday, part of a program aimed at improving conditions in private credit markets and spurring lending. The debt bought included notes maturing between 2016 and 2019. Dealers submitted $26.8 billion in debt to be purchased. The Fed will continue its buybacks with another operation on Thursday, heading towards purchasing $300 billion in Treasury securities over the next six months. Ten-year note yields stayed down by 2 basis points to 2.82%. Why Capital Structure Matters - By Michael Milken - The Wall Street Journal - "Thirty-five years ago business publications were writing that major money-center banks would fail, and quoted investors who said, 'I'll never own a stock again!' Meanwhile, some state and local governments as well as utilities seemed on the brink of collapse. Corporate debt often sold for pennies on the dollar while profitable, growing companies were starved for capital." More Hatred From Mr. Ahmadinejad - The New York Times - "The fear all along has been that the United Nations conference on racism would be manipulated into yet another forum for demonizing Israel. All too predictably, Iran’s president, Mahmoud Ahmadinejad — who has called the Holocaust a myth and has advocated Israel’s destruction — did just that." We have been handling some clean up issues following tax season, so we should be back to the daily posts starting tomorrow. Sorry for the delay, and thanks for the various e-mails and messages about making it through tax season. It is tax time, so please pardon the delay to send out the daily blog. It will be back to the normal daily e-mails very soon. By the way, Rollins & Associates, P.C. and Rollins Financial Counseling, Inc. will be closed on Friday, April 17th for our annual day of rest after tax season. Well, we are now in crunch time mode for tax season, but there is a Wednesday at the end of the tunnel. Rollins & Associates, P.C. is hard at work, and with the traditional ritual of taxes on the desk and The Masters on the television, the end is in sight. Today, we have a variety subjects covered, so take your pick and enjoy. The Tax Capital of the World - The Wall Street Journal - "States are raising taxes despite the 'stimulus'; New York is No. 1." Reviving the Motor Voter Law - The New York Times - "In 1993, Congress passed the National Voter Registration Act, widely known as the motor voter law, to make it easier for eligible voters to register and to increase registration rates of traditionally underrepresented groups, including poor people." Forget About Merit - The Wall Street Journal - "We're starting to understand what labor El Supremo Andy Stern meant when he called the Obama Administration a "once in a lifetime opportunity" to press the union agenda. Last month the Pentagon announced it would "review" a pay-for-performance system that now covers some 200,000 of its civilian employees, delaying any new entrants to the system. In short, merit pay for work well done. Fugettaboutit. House Democrats are now pushing to freeze pay for performance across the entire federal government." The Obama Holiday Tour - By Gail Collins - The New York Times - "Americans with less religious inclinations can look forward to the upcoming Earth Day celebrations, when the president is planning to do something as yet unannounced, but undoubtedly special, and Arbor Day, when rumor has it that he will not just plant a tree, but personally reforest a large swath of the nation of Mali." Tiger Woods Rivals Jordan, Trumps March Madness - By Scott Soshnick - Bloomberg - "One channel was showing the closing moments of a seesaw National Collegiate Athletic Association tournament game. Another channel was showing Tiger Woods, who, after entering the final round of the Arnold Palmer Invitational five strokes back, was standing over a 16-foot, he-makes-it-he-wins-it birdie putt on the 72nd hole." The Nano Helps Tata Surge - U.S. listed shares of India's Tata Motors jumped 23% to $8.19 early Thursday on a report that its Nano minicar is seeing a surge in interest on its first day for bookings. The company sold more than 51,000 order forms for the world's cheapest car, according to the Economic Times. The Nano, priced starting at less than $2,500, is slated to be delivered this summer in phases to the first 100,000 customers chosen by lottery. Tata is planning to export the Nano to Europe and the United States over the next few years. Natural Gas Falls on Data - Natural-gas futures reversed earlier gains after data showed U.S. inventories rose last week more than expected. The stockpiles rose 20 billion cubic feet in the week ended April 3, the EIA reported. Analysts surveyed by Platts had expected an increase of 11 billion cubic feet to 16 billion cubic feet. After the data, natural-gas futures fell 1% to $3.595 per million British thermal units. Futures had been trading up 1% before the data. Obama Says 9 Million Americans Can Reduce Mortgage Payments - President Obama said early Thursday that up to 9 million Americans can reduce their mortgage payments by refinancing using government programs. Speaking at the beginning of a White House roundtable about housing finance, Obama said mortgage rates are at historic lows and a typical homeowner can now save about $2,000 a year by refinancing. "The programs that have been put in place can help responsible folks," Obama said. Wells Fargo Beats, Stocks Rally - Wells Fargo & Co. predicted a record $3 billion profit (55 cents per share) for the first quarter, and the market rallied in response. The projected numbers are after preferred dividends, including $372 million in dividends paid to the U.S. government, are taken into account. Analysts surveyed by FactSet Research are expecting, on average, profits of 31 cents a share. Wells Fargo said it expects total revenue for the quarter to be $20 billion. The firm will report its first-quarter results on April 22. Barclays Sells iShares for $4.4 Billion - Barclays said Thursday that it has agreed to sell its iShares exchange-traded fund (ETF) business to CVC Capital Partners for $4.4 billion. The bank said it expects to generate a net gain on the sale of $2.2 billion and that it will increase its Equity Tier 1 capital ratio by 0.54 percentage points. Barclays said the deal gives it 45 days to solicit other potential bids for the unit. Barclays will provide debt financing of $3.1 billion for the deal, with the remainder of the purchase price funded by equity provided by Blue Sparkle, the bid vehicle set up by CVC. Gold Falls Again - With optimism building, gold is falling. The metal that is traditionally a "safe-haven" is poised for a third straight week of losses. The global optimism that has rallied stocks for the past month has led to a decline in the metal's appeal. Gold was trading around $877 an ounce, and it has lost about 2% this week. Wholesale Inventories Drop 1.5% - For the first time in eight months, inventories at U.S. wholesalers declined in relation to sales, a sign that massive inventory liquidation may be having some impact. Inventories at U.S. wholesalers fell 1.5% in February while sales increased 0.6%, the Commerce Department reported Wednesday. The inventory-to-sales ratio -- a key gauge of how lean inventories are -- fell to 1.31 from 1.34, the first decline since June. A year ago, the inventory-to-sales ratio was 1.14. Businesses have cut back on production and new orders as they try to bring their supplies of goods back into balance with demand. Speculation of Government Aid Lifts Insurers - Shares of U.S. life insurers rallied on Wednesday morning after a published report said the Treasury Department has decided to extend bailout funds to several struggling companies in the sector. According to a report in The Wall Street Journal, an extension of the TARP is expected to be announced in the next several days. Keeping life insurers on solid footing is seen as crucial to maintaining confidence, the report said. Several insurers, including Hartford, Genworth and Lincoln National agreed to buy savings and loans last year so they could call themselves banks, it added. 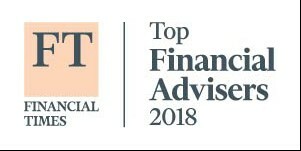 Genworth rose 20%, Hartford added 31%, Lincoln climbed 43%, Principal Financial added 40%, while Prudential Financial and MetLife rose 12% and 10% respectively. US Oil Inventories Rise Less Than Expected - Crude oil futures rose from their earlier losses Wednesday after the U.S. Energy Information Administration (EIA) reported an increase in last week's crude inventories that was less than analysts had expected. Crude inventories rose 1.7 million barrels in the week ended April 3, the EIA said. Analysts at Platts had expected an increase of 2.3 million barrels. After the data, crude was down 0.5% to $48.91 a barrel, but higher than pre-report trades of down 2%. The EIA also reported gasoline inventories rose 600,000 barrels while distillate stockpiles, which include heating oil and diesel, fell 3.4 million barrels. Treasury Says GM/Chrysler Plans Will Restore Credit - Auto supplier support programs launched by General Motors and Chrysler will help stabilize the auto supply base and restore credit flows to a critical sector, the U.S. Treasury said Wednesday. The programs began Wednesday and are backed by the Treasury. "The supplier support program will provide supply companies with access to liquidity and protect good-paying American jobs while giving GM and Chrysler reliable access to the parts they need," said a Treasury spokeswoman. Moynihan May Be in Line to Replace Lewis - Brian Moynihan, the lawyer who took over Merrill Lynch & Co. after the departure of John Thain, is increasingly seen as the right-hand man and potential successor to Bank of America Chief Executive Ken Lewis, according to The Wall Street Journal. In a report published Wednesday, the paper said Moynihan is on the working list of candidates to replace Lewis, who definitely plans to step down within three years. Others on the list include mortgage head Barbara Desoer and Chief Financial Officer Joe Price. The report added that there are tensions inside Merrill, where Moynihan had clashed with top executives. Bank of America Should Keep Lewis After ‘Mistake,’ Whitney Says - By Sean B. Pasternak - Bloomberg - "Lewis 'has done a great job' except for the Merrill Lynch deal, said Whitney, speaking to reporters today before appearing at a panel discussion in Toronto sponsored by Sprott Asset Management Inc. She called the Merrill Lynch purchase Lewis’s 'one major mistake acquisition.'" Fraidy-Cat Banker, and Proud of It - By Holman W. Jenkins, Jr. - The Wall Street Journal - "'Build things slowly.' The aphorism comes from a family video of the late Jackson Stephens, co-founder of Little Rock's Stephens Inc., the privately held investment bank that bears his name. The financial world, until recently, was engaged in a different experiment -- build things fast. Use lots of leverage. Let diversification and hedging extract stable, safe returns from a fast-moving, risky world. We all know how that ended." Some economic and market hope was restored as the month of March drew to a close and the first quarter of 2009 mercifully ended. All hope was not lost as prognostications of “Dow 5000” relented to talk of “Dow 8000” or even “Dow 9000”. What’s 4000 market points between friends? Optimism, albeit guarded, became more fashionable towards the end of the month. The recent upturn in the market most likely signifies a stabilizing economy in the months ahead. Stock markets are a leading economic indicator; therefore a continued rally would suggest real economic growth, as opposed to stability, before the end of 2009. Stock markets began the quarter breaking the previous November lows, racing to fresh 12 year market lows. After one of the worst investment years of all time, the continued slide after the 1st of the year was just that much more agonizing. Markets erased most of the initial 25% decline for 2009 to close the month off by a “manageable” 11% decline for the year. It’s interesting to note that each time there has been a significant 4th quarter market decline, as we saw in 2008, the market has moved to fresh lows in the following year. In addition that new low (which we may have achieved in March) has also marked the end of a bear market. While we are loath to suggest certainty in this pattern holding true this year, it does give investors some much needed solace. As we mentioned, the S&P 500 logged a loss of 11% over the first three months of the year, while the Dow Industrial Average dropped 12.5% and the NASDAQ was relative stand out, dropping only 2.8% for the first quarter of 2009. Technology stocks did underperform the overall market in 2008, but the relatively strong balance sheets consisting of little debt, has let the once speculative sector transform into relative refuge for nervous investors. The developed international markets continued to underperform losing 16.21%, as a resilient U.S. dollar showed continued strength. Some would have expected the U.S. dollar to be weak in the face of enormous government deficit spending. Given the lousy economic environments in the developed economies abroad, the U.S. Dollar is again showing to be a safe haven for reserves. Emerging market stocks did better, barely posting negative returns of 0.6% during the 1st quarter of 2009. Individually, Brazil and Russia were the big winners posting positive returns of 10.4% and 8.1%, while Chinese shares were even for the 1st quarter. These markets all significantly underperformed the broad U.S. indices in 2008, so some initial outperformance early in 2009 is not surprising. Financials and Real Estate Investment Trusts were two of the worst performing groups during the first quarter at negative 28.4% and negative 35.8% respectively. These ugly returns would have been far worse if not for a significant bounce over the past few weeks, which actually outpaced the rebound seen by the broader market. The recent market recovery coincided with positive comments from some bank executives, who claimed to have achieved modestly better results in the early part of 2009. In addition the markets were buoyed by anticipation of some relaxation in the mark-to-market accounting rules and some positive response to more details about the government plan to auction off some of the mortgage backed assets on the bank’s balance sheets. Bonds, on average, were slight losers during the 1st quarter as the aggregate bond index fell by nearly 2%. An encouraging sign to some bond investors was the increased demand in higher yielding corporate bonds. Investors moved out of U.S. treasuries, contrasting with massive flight to safety seen last year. The 10-year treasury yield moved higher by 0.5%, leading intermediate and long term U.S. government bonds to perform poorly during the month posting negative returns of 1.43% and 10.9% respectively. Historically, treasury rates are still extremely low as investors continue to prefer the safety of U.S. backed government debt. Inflation protected bonds performed well, gaining 3.5% for the quarter as inflation expectations rose. The government continues to dominate the market sentiment as it seems the financial epicenter has moved from Wall Street to Washington, D.C. The Congress and the president continue to steal the economic headlines as stimulus spending has been passed as well as legislation regarding banking and housing fixes are considered. Eventually, the endless debate about the virtue or folly of the proposed, and yet to be proposed, plans will end and investors will be able to make sense of where the government stands on these issues. In the mean time its causes some additional uncertainty for the financial markets. As a result of the bailout efforts and stimulus spending, some have argued that the amount of debt the government is undertaking us going to cause a great burden in the future. While this is a valid concern, the future burden on “our kids and grandkids” as the Pols cry is not simple to analyze. We are certain that Dr. Evil (Austin Powers’ insidious rival), let alone mere mortals, would be challenged to consider such astronomical figures such as “trillions”. As World War II came to an end, the U.S. government debt came to a staggering 125% of the GDP at that time. Strong economic growth in the post war period, which outpaced government spending increases, facilitated a reduction in the national debt burden to a more sustainable level of 40-60% of GDP in roughly 15 years. Currently, even after accounting for a massive stimulus plan, the U.S. is carrying a national debt towards the upper range of the 40-60% of GDP level. We are not necessarily advocating the current debt level, as we would suggest a smaller debt burden to be advantageous. However, we don’t consider the current debt load as an insurmountable challenge to the country itself, as some have opined. Certainly the merits of the stimulus package and other government initiatives are more than debatable, but the amount of debt the government is undertaking should be portrayed in proper context. Much has been made of the lousy stock market returns of the past decade. Including the recent market tumult, the S&P 500 has produced the worst 10 year track record ever, when adjusting for inflation. However, a well diversified portfolio including international stocks, bonds, real estate and commodities would have significantly enhanced returns for investors over the past 10 years. We continually advocate well diversified portfolios for investors, but given the recent returns on various asset classes we would suggest that U.S. stocks are likely to post very positive results over the next decade. As we have noted before, stocks historically, have produced returns of 10% on an annualized basis. Should equities continue on their long term historical path, we would suggest that stocks are likely to out-perform these other asset classes over the next decade. The 1970’s, which included a decade of relatively poor stock market returns, ushered in 20 years of significant outsized returns for the S&P 500 during the 1980’s and 1990’s. While investors would rather that stocks produce more consistent results, we are optimistic that the low stock valuations seen today will lead to positive results over the next decade, as the future is not likely to not resemble the past 10 years. Treasury Extends Deadline for Toxic Asset Plan - Fund managers will now have until April 24 to submit bids to the Treasury Department to participate in the public-private investment program to buy toxic assets from banks. The government extended the deadline to give more companies a chance to apply, and said it would consider firms that don't meet the standard of having $10 billion in assets under management. "Participation criteria will be viewed holistically -- failure to meet any one criterion will not necessarily disqualify a proposal," the Treasury said. Ford Reduces Debt by $9.9 Billion - Ford said it reduced its debt by $9.9 billion, lowering its annual interest expense by more than $500 million as the struggling auto maker continues to resist going to the U.S. government for aid. Ford and Ford Credit will use $2.4 billion in cash plus 468 million shares of Ford common stock to reduce Ford's outstanding debt by $9.9 billion from $25.8 billion at Dec. 31. "The successful debt restructuring, together with previously announced agreements with the United Auto Workers, will substantially strengthen Ford's balance sheet," the auto maker said. "Ford is taking another step toward creating an exciting, viable enterprise," said Ford President and CEO Alan Mulally. Oil Drops - Crude oil fell early Monday after last week's surge at the end. It seems that investors are trying to calculate the optimism over signs of recovery in the U.S. economy in the absence of any data. Crude oil dropped $0.76 to $51.74 a barrel. Gold Falls as Optimism Sweeps the Globe - Gold futures fell early Monday for a third straight session. The fall has wiped out the gains for the year as hopes the global downturn may be bottoming out reduced the metal's appeal as a safe haven. Gold fell $14.30 (1.6%) to $881.30 an ounce. Gold has lost nearly 5% since April 1 and is now down slightly for 2009. The Return of Jumbo Mortgage - By Amy Hoak - The Wall Street Journal - "Jumbo mortgages became more expensive and harder to come by as the nation's credit crisis deepened. That might be starting to change. 'Jumbo' refers to mortgages that are too large to be bought by Freddie Mac or Fannie Mae. The 'conforming loan limit' for those government-backed entities is $417,000 in many parts of the country, but goes up to $729,750 in high-cost areas of the continental United States." From Bubble to Depression? - By Steven Gjerstad and Vernon Smith - The Wall Street Journal - "Why the housing crash ruined the financial system but the dot-com collapse did not." An interesting mix of op-eds have started to appear discussing the economy. The budget, The TARP, the bank plan, mark-to-market, the causes of the current crisis, etc. We have given a few examples below of some of the articles we read. Geithner's Bank Plan Is a Good Start - By Martin Feldstein - The Wall Street Journal - "If it succeeds, this plan will remove some $500 billion of impaired mortgages and securities from the banks, will do so at market-determined (albeit artificially enhanced) prices, and will give taxpayers a possibility to gain along with the private investors who manage the assets. It will do all of this without nationalizing any of the major banks." Greed and Stupidity - By David Brooks - The New York Times - "There are many theories about what happened, but two general narratives seem to be gaining prominence, which we will call the greed narrative and the stupidity narrative. The two overlap, but they lead to different ways of thinking about where we go from here." Mark-to-Market Rule Gives More Clarity, Not Less - By John M. Berry - Bloomberg - "Mark-to-market accounting rules are being brought a little closer to economic reality -- accompanied by misplaced howls of outrage." "Take the case of the Federal Home Loan Bank of Atlanta. Following the mark-to-market rules, it wrote down the value of its portfolio of mortgage-backed securities by $87.4 million in last year’s third quarter. Its actual projected loss on the securities: $44,000." 6 reasons I'm calling a bottom and a new bull - By Paul B. Farrell - MarketWatch - I am hesitant to put this article here because this author can be out of the ordinary, but to be fair, I decided to include it too. Just be warned about some of his past articles... - "Warning: Here are 6 reasons why Roubini can never fulfill his promise ... why he may go down in history, as Portfolio suggests, as the designated "one-hit wonder" ... but worse, any investor waiting for a Roubini "call" is playing Russian roulette, a loser's game ... you will miss the market's real turning point:"
Obama's $163,000 Tax Bomb - By Michael Boskin - The Wall Street Journal - "Families well below the president's 'no-tax' threshold will get a six-figure bill." "The House and Senate are preparing to pass President Barack Obama's radical budget blueprint, with only minor modifications, by using (abusing would be more accurate) the budget "reconciliation" process. This process circumvents the Senate's normal rules requiring 60 votes to prevent a filibuster. Reconciliation was created by Congress in the mid-1970s to enforce deficit reduction, the opposite of what the president and his party are aiming for." Obama Wants to Control the Banks - By Stuart Varney - The Wall Street Journal - "There's a reason he refuses to accept repayment of TARP money." "I must be naive. I really thought the administration would welcome the return of bank bailout money. Some $340 million in TARP cash flowed back this week from four small banks in Louisiana, New York, Indiana and California. This isn't much when we routinely talk in trillions, but clearly that money has not been wasted or otherwise sunk down Wall Street's black hole. So why no cheering as the cash comes back?" As our President made his first trip overseas to the G20 Summit, there have been numerous interviews, cartoons, and articles about him. I have heard from a few individuals that said the focus has been too much on the major media, so I have also tried to have editorials from throughout the country (Los Angeles, Beaumont(TX), Naples(FL), Cleveland, Minneapolis, and New Hampshire). The focus today will quickly shift from the funny to serious with articles covering how a past President handled Congress and move from there. 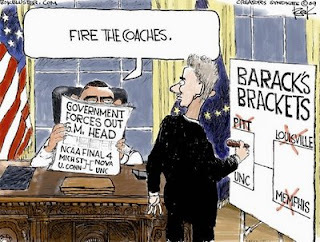 Both cartoons are from the Chicago Tribune. Can Obama Be a Majority of One? - By Robert Dallek - The New York Times - "Lyndon Johnson could have warned Barack Obama that winning the support of the 535 senators and representatives, even if a majority of them share your party affiliation, wouldn’t be easy." Cap and Tax Collapse - The Wall Street Journal - "Congress balks at one more bad Obama idea." Barack’s Continental Coolness - By Gail Collins - The New York Times - "If nothing else, the president’s trip overseas helped resolve the longstanding question of who can be more irritating, the Republicans or the French. Before we pursue that thought any further, let’s agree that the Obamas wowed them in Europe." Obama's Domestic Agenda Gains Clarity - By Peggy Noonan - The Wall Street Journal - "Different pollsters offer different data. The Washington Post this week put the president's approval ratings at 60% or higher; the Washington Times had a Zogby poll saying Mr. Obama's popularity has dipped below 50%; in this paper, the pollsters Douglas Schoen and Scott Rasmussen said the American people 'are coming to express increasingly significant doubts about his initiatives,' and placed the president's approval rating at 56%, 'with substantial polarization.'" Detroit Needed Obama's Tough Love - Beaumont Enterprise - "If the leadership of GM and Chrysler expected the same kid-glove treatment that their counterparts at AIG got at the start of this bailout binge, they received a rude shock." Michelle -- The Popular Obama - By Joe Frolik - Cleveland.com - "But here's an unlikely sign of bipartisanship: Michelle Obama's approval ratings are over 70 percent in two new surveys. Last summer, she was under 50 percent and well behind her husband; now she's more popular than he is. Big reason: Republicans seem to have decided she's not so bad after all." 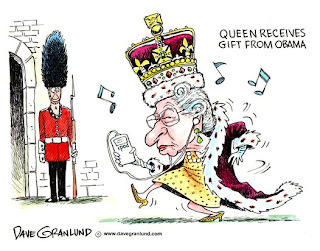 Give Obama a Break on the Gifts - Los Angeles Times - "Well, of course Queen Elizabeth II already had an iPod. She's the queen. Doesn't she have everything?" President Obama ... too much of an entrance? - Naples Daily News - "Obama arrived with a staff of 500 staff in tow, including 200 Secret Service agents, a team of six doctors, the White House chef and kitchen staff with the president’s own food and water. And, according to the Evening Standard, he also came with '35 vehicles in all, four speech writers and 12 teleprompters.'" Obama Is Right: It's Time for Change - New Hampshire Union Leader - "President Obama has shown us all that to achieve the unrealized promise of this great nation, we must transcend outdated values such as public thrift, individual liberty and restrained government. All power must be shifted to Washington and deposited in the hands of a wise and benevolent ruler whose will is never questioned." If Both Sides Are Upset, Is Obama Right? - By E.J. Dionne, Jr. - The Minneapolis-St. Paul Minnesota Star Tribune - "The great mystery of the Obama administration’s economic agenda is whether its signature marriage of boldness and caution will prove to be a Goldilocks recipe that gets things just right, or a Rube Goldberg approach of unimaginable complexity and uncertain purpose." Freddie Mac & Fannie Mae - Bonus Details - Mortgage giants Fannie Mae and Freddie Mac expect to pay about $210 million in retention bonuses to 7,600 employees over a year and a half, The Wall Street Journal reported Friday. The top retention bonus for any individual executive under the plan will total $1.5 million during the 18 months ending in early 2010, according to the report, which cited a letter from the mortgage firms' regulator. Dollar, Gold, Treasurys Fall After Job Report - The dollar fell slightly against major counterparts Friday, after the Labor Department said the economy shed 663,000 jobs in March (lower than analysts had expected), pushing the total number of jobs lost since the recession began to 5.1 million, and the unemployment rate to 8.5%. Gold futures extended losses Friday, down 1% to below $900 an ounce (after the jobs report) reducing the metal's appeal as a safe asset. Treasury prices also declined after the jobs report showed fewer job losses than had been previously expected. Stocks Going Higher After Jobs Report - U.S. stock futures gained steam on Friday, extending gains into a fourth consecutive day after the March unemployment report was released. Big Banks to Buy Toxic Assets? - Large U.S. banks that have received bailout money from the government, including Citigroup, Goldman Sachs, Morgan Stanley and J.P. Morgan Chase & Co., are eyeing purchasing troubled assets to be sold by other financial institutions under the Treasury Department's plan to revive credit markets, according to a published report. The Financial Times late Thursday reported the banks' plans are controversial and may raise public ire because the government's public-private partnership is designed to assist banks in selling, rather than acquiring, toxic assets. The public-private plan would have private investors and the Treasury put in equal amounts of money that would then be backed by a loan guarantee from the FDIC to buy loans and mortgage-backed securities from the banks. Free-Marketeers Should Welcome Some Regulation - By Paul Singer - The Wall Street Journal - "Reform must begin with a regulatory regime focused on "behavior" instead of "systemically important institutions." Today, even small entities that trade complex instruments or are granted sufficient leverage can threaten the global financial system. It's true that monetary policy was too lax for too long, and the government encouraged lending to people who were unlikely to repay their loans. But this crisis was primarily caused by managements and individuals throughout the financial system who exercised extremely poor judgment. The private sector, not the public sector, is where the biggest mistakes were made." After our little technical hiatus, we should be back up and running today. Google (which owns the blog service and the e-mail service) has apparently fixed all of the problems, so the feed and e-mails should be back up now. In the interim, there have been some interesting news stories such as the repayment of TARP funds by some banks, a G20 meeting, and the mark-to-market issue. Since we have not posted anything substantial since Monday, take some time to go through the notes and the articles. Financials Continue to Rise on Mark-to-Market Ease - Financial stocks have been rising on an expected decision from the nation's accounting board to ease guidelines and help bolster the bottom line at troubled banks. The Financial Accounting Standards Board (FASB) is expected to vote Thursday to give auditors more flexibility in valuing illiquid assets that may have a long-term value and strong cash flow -- in other words, they are not distressed assets, but they can't be sold in the markets today. ECB Cuts Rate by 0.25% to 1.25%; Not Unanimous - At a post-rate decision press conference, European Central Bank (ECB) President Jean-Claude Trichet said the decision to cut rates by a quarter-point to 1.25% wasn't unanimous, it was by "consensus." Further, at the next meeting, non-standard measures akin to quantitative easing will be discussed. He said the main refi rate of 1.25% could go lower, but said the deposit rate of 0.25% probably would not. ConocoPhillips Refineries Running at 80% Capacity - ConocoPhillips said Thursday its total first-quarter production is expected to be approximately 30,000 barrels of oil equivalent per day higher than the fourth quarter. The company's exploration and production results will be impacted by losses in the U.S. lower 48 states and Canada mainly because of lower realized natural gas prices. Refining and marketing results for the first quarter are expected to be lower due to a decrease of more than 50% in worldwide marketing margins. The company said its domestic refinery utilization rate is expected to be approximately 80%, "reflecting significant planned turnaround activity in the U.S. Gulf Coast and East Coast regions." Four Small Banks Are the First to Pay Back TARP Funds - By Eric Dash - The New York Times - "Four small banks became the first to return millions of dollars of emergency aid, and more may soon follow as the industry tries to escape what it considers the onerous conditions attached to the government’s money. Signature Bank of New York said on Tuesday that it had repaid $120 million to the Treasury Department. Old National Bancorp of Indiana returned $100 million, Iberiabank of Louisiana paid back $90 million, and Bank of Marin Bancorp of Novato, Calif., repaid $28 million. All of the banks paid 5 percent interest on the money they had received." Treasury's Very Private Asset Fund - By The Wall Street Journal - "Why write the rules to favor only a handful of bidders? - The Obama Administration insists it wants to "partner" with private investors for its new toxic-asset purchase plan. But the more details that emerge, the more it seems Treasury wants to work with only a select few companies. This is no way to conduct a bank clean-up." Reminders From Out of the Blue - By David Pogue - The New York Times - For everyone that is too busy to remember everything... "In a nutshell, Reqall is an effortless personal reminder system. You speed-dial its toll-free number and dictate whatever it is you want to remember." According to the fine folks at Google and Blogger, e-mails are still having problems (today is now Wednesday). Hopefully, everything will start working again today, and I'll start posting again tomorrow.